Thanks very much for my owl and hawk experience. Couldnt believe the amount of birds you brought out for me to fly, was only expecting a few. Today I went to the birds of prey centre and I got to fly 3 really big owls! The first one was quite big but I wasnt scared I put myself forward straight away, this bird was called Knowlie. Really enjoyable time spent flying several birds. Would also like to thank Roy & Ian for providing us with a very informative & enjoyable experience. A Great Day Out For Everyone: We saw lots of birds including Barn owls, Great Grey owls, Kestrels, and lots more. Flying The Most Amazing Birds: I have always wanted to do it and I wasnt disapointed at all it was magical !!!! Thanks For A Great Day: We just wanted to drop you a quick note to say what a great day we had there today. An Unforgetable Day At Turbary Woods. I came to Turbary Woods for the day and it was one of the best days of my life and I will never forget it. A Birthday Celebration Visit To Turbary Woods: My husband and I had a wonderful afternoon at Turbary Woods to celebrate my birthday - a present from my niece and family. Just to say thank you for a great afternoon. We all enjoyed flying the birds, particularly Gavin aged 8 & Jacob aged 4! A Great Hawk and Owl Experience Day: Thanks for a great day. I really enjoyed my Hawk and Owl experience and would recommend this to anyone. Enjoyable Day At The Bird of Prey Centre: Staff were great explaining the nature of the sanctuary and about the different birds - we even got to see and touch the baby barn owls and to also see a rare black barn owl. Big Thanks For A Great Day: My son Ethan a one very lucky boy! Keep up the good work, we will visit again very soon. A thousand thanks for a most excellent day. Gorgeous setting for your wonderful collection of feathered beauties! A Great Flying Experience Day At Turbary Woods: The owl and hawk experience day was a birthday gift from my wife and something I have wanted to do for a long time. 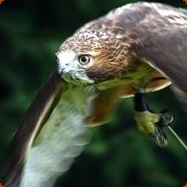 A Day To Recommend: I really enoyed my Hawk and Owl experience and would recomment this to anyone with an interest in these wonderful birds.